Monday 26th September was not the sort of evening to encourage one out – cold, rainy and definitely felt like Autumn. However a good few CAMRA members caught the No.10 bus to join me, local CAMRA members and customers at the Lord Collingwood for the celebration. As a Marston’s tied house, the beer choice on offer was Ringwood Best Bitter & Boondoggle, Thwaites Wainwright, Marstons New World, Banks’ Sunbeam and house special Colly Wobbler (the Hobgoblin was off). Licensee Sarah Heaton kindly provided sandwiches and home-made chips (by the fair hand of barmaid Karen) while husband Andy, fresh home from his day job, lit the fire for us. It is customary to explain what CAMRA is about to the public during our speech, but when I looked around I couldn’t see any non-members! Little point in preaching to the converted so I passed on this, left some of our local recruitment leaflets and got on with the main event. 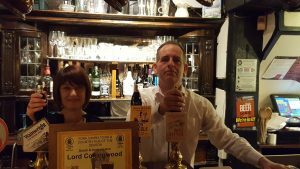 It is hard work running a pub anywhere and particularly in the villages and Pub of the Season awards were one way of giving rare recognition and encouragement to the people in the business. The Heatons were congratulated on their first successful year, despite challenges like needing to close the kitchen for major refurbishment and Sarah’s ongoing fo ot problem. They did their best to offer beer variety with Marstons specials and guest festival ales. 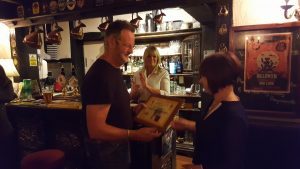 Andy expressed their gratitude for CAMRA’s attention and the certificate was quickly on display over the fireplace. Keep up the good work you guys. Interestingly, another of the local pubs is the Lord Nelson in Nether Poppleton. Both men are neighbours in death too, buried side by side in the crypt at St Paul’s Cathedral, London! This entry was posted in POTS, Presentations, Pub News on 30th September 2016 by York CAMRA. 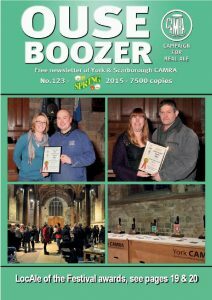 This entry was posted in OB126, Ouse Boozer, Ouse Boozer Magazine on 1st December 2015 by York CAMRA. 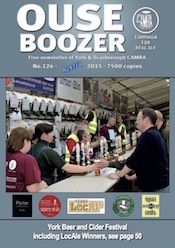 This entry was posted in OB125, Ouse Boozer, Ouse Boozer Magazine on 1st September 2015 by York CAMRA. 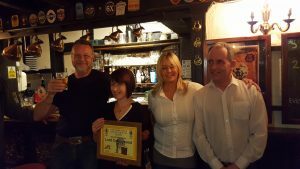 Country Pub of the Season Spring 2015 has been awarded to The Unicorn Selby. It was presented to Keith Bond the manager by Terry French. Congratulations to all the staff and management. This entry was posted in News on 29th August 2015 by York CAMRA. 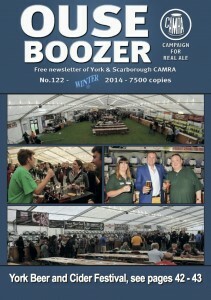 This entry was posted in OB124, Ouse Boozer, Ouse Boozer Magazine on 1st June 2015 by York CAMRA. 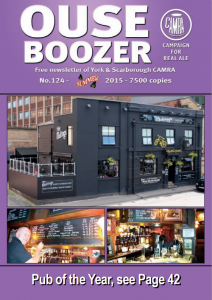 This entry was posted in OB123, Ouse Boozer, Ouse Boozer Magazine on 1st March 2015 by York CAMRA. 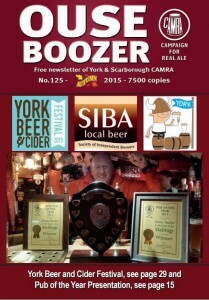 This entry was posted in OB122, Ouse Boozer, Ouse Boozer Magazine on 30th November 2014 by York CAMRA. 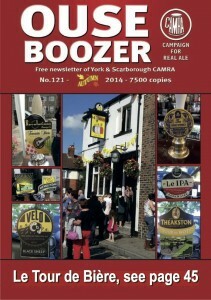 This entry was posted in OB121, Ouse Boozer, Ouse Boozer Magazine on 30th November 2014 by York CAMRA. Both The Fox on Holgate Road and The Mitre on Shipton Road have been listed as assets of community value and included on a council register of important facilities. This entry was posted in Pub News and tagged the fox, the mitre on 20th July 2014 by York CAMRA. Please join us in welcoming a new brewery to York. Ainsty Ales is the brainchild of former policeman Andy Herrington and promises to be a welcome addition to York’s burgeoning beer scene. This entry was posted in Branch Breweries, LocAle Breweries and tagged Ainsty Ales, locale on 6th July 2014 by York CAMRA.